The Songs of Danaray – Imogen The Dreamer is a two – fold approach to powerful teaching of Spiritual Development. This book is a teaching guide complete with meditations , shamanic journeys, ceremony, invocation, clairvoyance /mediumship exercises and philosophical spiritual observation and discussion relating to individual and collective development. The Songs of Danaray – Imogen The Dreamer is a two – fold approach to powerful teaching of Spiritual Development. This book is a teaching guide complete with meditations , shamanic journeys, ceremony, invocation, clairvoyance /mediumship exercises and philosophical spiritual observation and discussion relating to individual and collective development. It is also the story of Imogen a Druidic Dreamer Priestess, it weaves fiction and Spiritual Development creating a powerful tool to open the gateway to direct contact with Spirit by stimulating the most creative tool we have as humans, the imagination and hence developing the inner senses to see, hear, feel and commune with the Great Spirit. Steve Wilkes is Priest of Avalon dedicated to the Ancient Goddess of those parts, the Queen of the Fairie, he sees his role as primarily one of supporting others to consciously walk their own Spiritual Path and connect with their own destiny in the way that is most appropriate to them. Steve is a full time Clairvoyant Medium and works with many Spirit Guides and Power Animals particular the two primary Spirit beings he connects with Danaray and Chung Fu. He trained with Chung Fu for four years in a full trance channel circle and also received some training in Spiritualist Churches in London and New Zealand as well as from Kiri Gerrard a Maori Clairvoyant who often taught Spirit connection via Maori myth. As a child he was brought up in an evangelical Christian family where he first learned his love of the Divine. 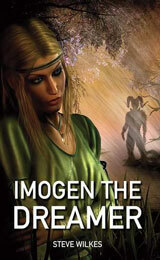 Be the first to review “Imogen The Dreamer – Steve Wilkes” Click here to cancel reply.